Buckhead Betty ... on a Budget: Toast to Ten! 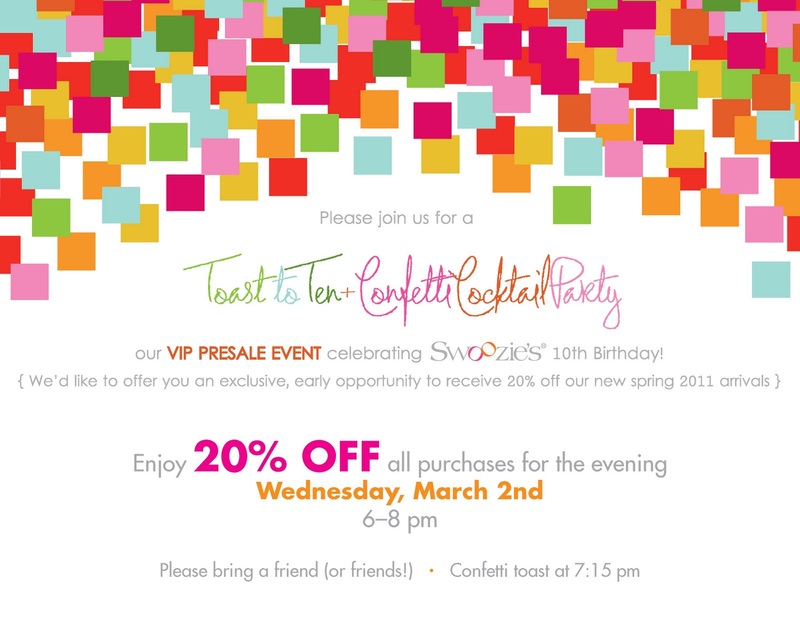 I am excited to have been asked to attend a fun-sounding party this evening up at the Swoozie's on Roswell Road -- their Toast to Ten Party in honor of their Tenth Birthday! Swoozie's, in case you are not familiar with the uber-cute store, is known in the Atlanta and Southeast region as a great source of stationery, party supplies and gifts for all types of occasions. I am excited to see what they have in store for the crowd tonight, and look forward to checking out the items, since all purchases will be 20% off! With all of the wedding festivities coming up for my friends this spring and summer, this promotional event is perfect timing for me. Are you attending this party tonight, too? I hear that they have some fun things going on in the upcoming ten days, so if you can't make it tonight, you will have some other fun things to look forward to! Disclaimer: Swoozie's contacted me about this party and their 10th Birthday plans. I am excited to attend on my own accord, and all opinions expressed here are my own. Cailen - I know! Whenever you hit Atlanta someday, you know who to hit up! Patti - too sweet, thank you! What a blast to hang with you too!